JNN 28 Apr 2015 WASHINGTON — Maryland governor Larry Hogan Monday evening declared a state of emergency and activated the National Guard to address the escalating violence and unrest in Baltimore City following the funeral of a 25-year-old black man who died after he was injured in police custody. Hundreds of rioters in northwest Baltimore Monday afternoon looted stores and went into confrontation with police force with bricks, hours after Freddie Gray, who passed away on April 19 after being severely injured a week earlier during police arrest. According to preliminary investigation, Gray had suffered a severe spinal injury during or shortly after his arrest. Baltimore’s Police Commissioner Anthony Batts acknowledged on Friday that Gray, 25, was not treated properly after being arrested. The Baltimore Police Department announced earlier a “credible threat”, saying that gangsters had entered into a “partnership” to target law enforcement officers. After hours of chaos and unrest, hundreds of police later Monday moved into streets which had so far witnessed the worst of the violence, and used pepper spray on rioters who had robbed check-cashing and other stores. A CVS pharmacy store in the region was set ablaze after being looted on Monday evening, and several cars, including at least three police patrol cars, were set on fire. “A violent and aggressive group has now moved to the area of North Avenue and Smallwood St. Motorists should avoid this area,” warned the Baltimore Police on its twitter account. As looters continued to “break into business and set cars on fire”, as declared by the police department on its twitter account, Baltimore Mayor Stephanie Rawlings-Blake announced curfew Monday evening. “A general curfew will be in effect in Baltimore City from 10 p.m. Apr 28 – 5 a.m. May 4th unless renewed or rescinded by order of the Mayor,” said the Baltimore Police department in an online statement. According to the Baltimore police department, 15 police officers were injured during conflicts with rioters. The University of Maryland has shut down its Baltimore campus, hours after funeral ceremony on Monday for Freddie Gray, a 25-year old African-American man who died in police custody week ago in Baltimore, the largest city in U.S. State of Maryland. The city’s police department announced earlier Monday that they have obtained information indicating a “credible threat” that local gangs were targeting police officers and it was not clear if the threat to officers was directly tied to the concern for safety at the school. Monday morning, the funeral of Freddie Gray drew was held at a local church amid march of thousands of protesters that has developed into a riot afterwards. On CNN TV report, dozens of people could be seen throwing objects at police, resulting minor hurts of several police officers during the riot near a mall in northwest Baltimore. Gray’s death on April 19 while in police custody set off a week of protests. Most of the protest were quiet, until Saturday night. Protesters marched in Baltimore Saturday to bring attention to the suspicious and fatal chain of events surrounding Gray’s arrest by Baltimore police on April 12. It’s suspected that Gray incurred a severe spinal cord injury during his ride to a police precinct. It has been reported that Gray requested and was denied emergency medical care before dying a week later in a Baltimore hospital. Baltimore Police Commissioner Anthony Batts said Saturday night that the protesters has become violent and began to throw objects. So far, a number of police patrol cars were smashed and at least seven police officers suffered minor injuries, CNN reported, while 34 people were arrested. Batts said some residents moved between police and the angry crowd, urging the protesters not to damage the city. He commended police officers for showing “tremendous restraint” and city residents for helping tamp down the unrest. Following a day of riots in Baltimore, a community center and apartments owned by the Southern Baptist Church in East Baltimore were set ablaze and burnt down before firefighters managed to contain the flames. Firefighters were forced to respond to the three-alarm fire at 8:49pm, after the flames engulfed the five-story building at Gay and Federal streets. “We were able to dispatch units as soon as we got the call,” Baltimore Fire Department spokesman Capt. Roman Clark said, as law enforcement officers with shotguns cordoned off the fire hazard area. More than 90 firefighters responded to battle the flames. The cause of the fire is under investigation, Clark said, as riots following Freddie Gray’s funeral raged across the city. 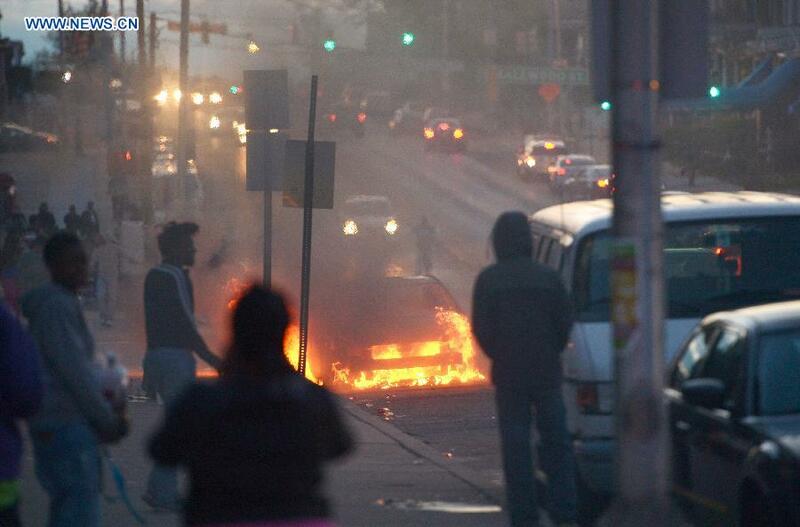 No one was injured in the East Baltimore blaze. A spokesman for the mayor of Baltimore, Kevin Harris, said the fire at the Mary Harvin Transformation Center was related to rioting in the city. Firefighters managed to calm the fire just before 10:00pm and were spraying water over surrounding structures to ensure no flames spread. The Southern Baptist Church was building the center to provide 60 affordable apartments and behavioral counseling for seniors. The construction was ongoing since 2006 by the Woda Group, a low-income housing developer. Senior vice president of The Woda Group, Kevin Bell, also vowed to rebuild the housing and community center. “This does not make us go away,” he said. The city lent $15 million towards the construction of the units. The State Department of Housing and Community Development granted another $200,000 last year toward the center. The Southern Baptist Church fire is one of many the Baltimore City Fire Department has been battling as riots erupted throughout the city. Baltimore’s firefighters are taking precautions to protect themselves against violence. This entry was posted in America, United States and tagged African American, America, Baltimore, Baltimore Police, Baltimore Police Department, Freddie Gray, Maryland, Racial Discrimination, United States. Bookmark the permalink.